"Your imagination is the preview to life's coming attractions." Our minds can’t easily distinguish between what we visualize and what we actually experience. Many experiments support this. One well-known experiment by psychologists involved a number of men divided into three groups. One group practiced basketball every day, the second mentally visualized themselves practicing, and the third—the control group—did neither. The study found that the men who physically practiced and those who mentally practiced were equally good on the court. The control group lost to both groups. Other experiments have shown that when people visualize themselves performing an action—running, for example—the muscles associated with that action contract in small but definite amounts. You can prove this to yourself by closing your eyes and imagining yourself sucking on a lemon. Your mouth will pucker and start to water. Optimal visualization enables you to convey to your subconscious mind exactly what you want by using the best pictures and symbols and all of your senses. By giving yourself the optimal preview, the desired result becomes real and concrete and you prepare yourself to experience the best. You start to adjust yourself toward having what you want by incorporating it physically, emotionally, and mentally. Optimal visualization prepares you to reach your most desired goals. You deserve the best life has to offer! Are you ready to put your best foot forward in your personal and professional life? Learn how with Optimal Thinking. Hailed by academia and the media as “The successor to positive thinking”, Optimal Thinking is the language of your best self. 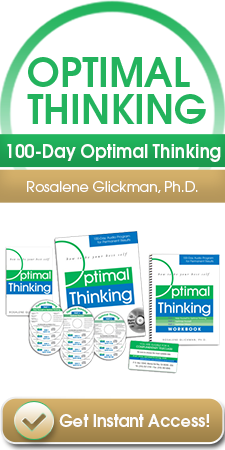 In this powerful audio, Dr. Rosalene Glickman, best-selling author of Optimal Thinking, introduces you to the life-optimizing thinking that has replaced the “Think Positive” motto all over the world. She shows you how to match your thoughts and behavior with your highest vision of yourself, and how to put your best self in charge of your personal and professional life. 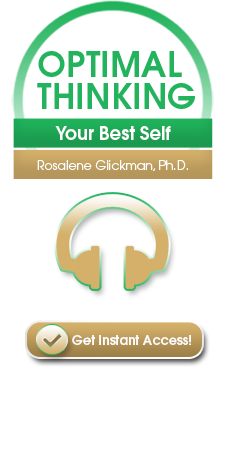 Dr. Glickman presents a visualization exercise in which you see yourself as all you can be. By giving yourself the optimal preview, the desired result becomes real and concrete and you condition yourself to be your best. You feel supremely competent, confident, and function with an optimal mindset. So don’t just be a positive thinker. Be an Optimal Thinker. Perform at your peak in business, bring out the best in all around you, and make the most of your life.